Here's what it looks like in your catalog. Y'all come back t'marrah, hear? Some untranslatable stuff and those darn span tags. In further good news, you can now order printed barcode labels from LT! Why would I want labels that say "TIM SPALDING'S LIBRARY"? Because you're gonna send me your books. That's part of the deal. A great product for small lending libraries. I know from experience that barcode labels come with different strengths of adhesive. Some are "non-removeable", some almost fall off, and there are gradations between. Do we have adhesive choice? or how would you describe the default adhesive? >13 Crypto-Willobie: Good question! We're using labels with permanent adhesive, no options for other adhesives at this time (though there's a possibility of this changing as the feature evolves). Can you point them to the label source, K? You say that the sheets of "100" labels are actually 102. I don't think anyone would object to getting a couple more for free, but if people buy sets at different times and the numbering really does start from 501 for the second set after they got 508 in the first set, won't there be duplicated numbers? Barcodes at a discounted price. Great! Thanks! Reading that the barcodes come from Demco, I'm surprised to read this: "Comparable barcodes cost about that much. In fairness, however, if you spend even more from these companies you can get more durable barcodes, intended for high-circulation public collections." Being able to purchase bar codes when I'm ready to is very exciting. Thanks a lot! >3 elenchus: This is what I'm sayin' :o} It just gets better every day around here. That's a good question. I think I favor leaving two blank, for do-overs or something. That makes the math easier too. Right. We haven't really decided, but we did that for my tests. Is the glue acid-free? Will it discolour the paper and potentially bleed through the page after a few years, like Sellotape/Scotch tape does? Are there any assurances that this wont happen please. >21 Sylak: Indeed. Kristi's looking into it for us. I currently have the "Automatically add barcodes to new items" setting disabled, but any time I manually add a book, there's a 1 put there in the barcode field that I have to delete. Is it supposed to work like that? >21 Sylak: Sorry, they are not. The labels we're using are "Highsmith Earth-friendly Laser & Inkjet Labels", not archival (acid-free). >24 coprime: That sounds wrong, but let me check with the developers to make sure it's not how it was supposed to be set up. >25 kristi_test_01: What happened to the Demco labels in #17? >26 suitable1: what do you mean? nothing's changed. >27 norabelle414: those are not the labels we're using. we're using these: http://www.demco.com/goto?BLS169547&amp (item #WS14942220 for clarity), which are not archival. ETA: I may have misinterpreted the customer service response I got--it sounded like they were describing our labels as the Earth-Friendly, etc, which may not actually be the case. Sorry for the confusion! Let's get an answer there. Kristi? Can we find out how much archival ones are, K? I anyone still getting the problem with automatic barcodes? >32 timspalding: If you mean my comment about a barcode number being present when I manually add a book despite having automatic barcodes disabled, then yes. >34 METIER3: This topic is about a new feature that allows members to create their own barcodes for identifying books. A barcode that you have added yourself will not be helpful for entering books. I'll second METIER3's request - even if it's off-topic. I would like a way to scan an ISBN or any bar code directly into my smartphone and into a "new book" request. Everything mentioned in the link provided by MarthaJeanne above is a hack - need something that works directly with iPhone that doesn't require an unreliable and multi-step cut-and-paste. There are many apps that work on iPhone for similar (RedLaser, Amazon checker, etc) that work much better than a cuecat and don't require a desktop or similar system with a USB port. Your concern will be buried here because anyone looking for it will assume that the discussion here is about the new feature being announced. On the other hand it makes following the discussion of this feature that much harder. Okay folks, good news: we've now got the acid-free, archival barcode labels! Same size (5/8" x 1 1/4"), same price, but now acid-free. We'll update the Store soon. ETA: We're in the process of getting the new labels, so if you order labels now they will be a little late this time around, sorry for any trouble. Looking forward for that greatness of "Librarything" in all capacity of library catalogue in the future. Barcodes are free if you agree that, once you apply them, your books are now mine. Ssh, Tim, that's supposed to be buried deep in the "I agree" clickthrough licensing! What about some "use ISBN as my barcode" button? Not a bad idea. Not sure if it'll fit, though. Kristi? >43 tharos: and >44 timspalding: my inclination is that ISBNs won't fit, I tested up to 1,000,000, but unfortunately I won't be able to test them out until I get back from the Caribbean (yeah, bummer). I can test this out when I get back! Let me know. Yeah, ISBNs are at least 10 digits. 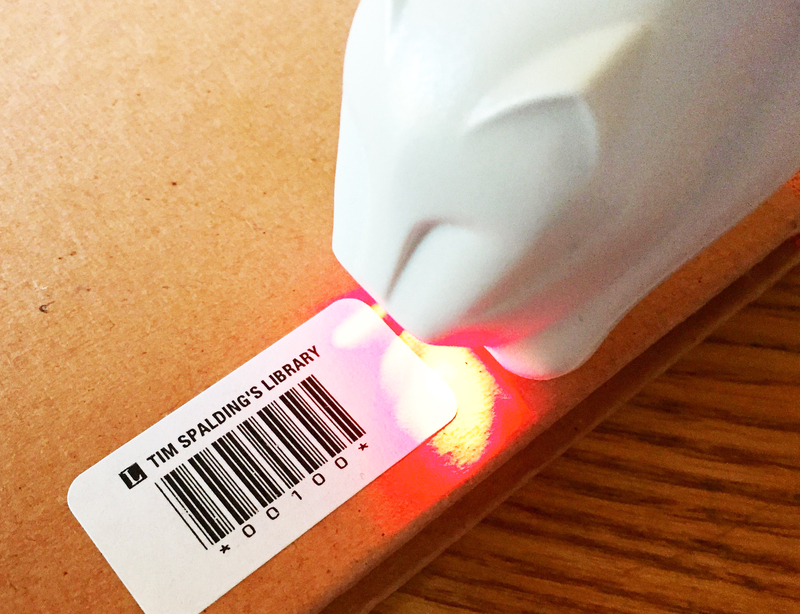 We also considered having the the LibraryThing "book id" be the barcode, but it's past 100 million now. Will we be able to put our books, which are already on LT, in a specific order (of our choosing) before assigning barcodes? Will we be able to assign the numbers in batches? The reason I ask is that it will be much easier to put the barcode labels on 1000's of books if the barcode numbers are assigned in "shelf order". >47 StJosephIssaquah: As of right now, yes and no. Barcodes are currently assigned in the order your books were added to your library. That's the order in which automatically added barcodes work. That's the "no" part. The "yes" part is that you can manually edit/input any of your barcodes, just like you would any other field—by double-clicking on it in Your Books to edit. However, I know this is tedious. No problem. We'll just print all the labels and then find the correct label for the next book on the shelf. These barcode labels are a wonderful addition to LT that can be used as accession numbers to end confusion with duplicate copies. We could add it. I wonder what sorts people would want besides that? Can the barcodes print the call numbers that people/libraries might have used in the "lending" feature? They could print LCC, Dewey or whatever other system has been used. >51 al.vick: The bar codes I have seen have been just numbers. >45 kristilabrie: I just tested out ISBNs on our printed barcodes, and they are a no go unfortunately. The barcodes will fit on the label if you size the font properly, but the CueCat can't read it once it actually fits (font size 6 or 7, depending on whether it's a 13-digit or 10-digit ISBN). The smallest I've been able to get the CueCat to read is font size 8. Is this an issue of print resolution? (e.g. laser vs. ink jet; 600 vs 300 dpi). On occasion I've seen some pretty fine barcodes. I don't recall if the CueCat could handle them. We've got both inkjet and laser printers, not an issue of resolution, I don't think. We are in the process of entering our church's music collection into LT and will soon be working on the main holdings. Our problem is saving barcodes. If we enter the barcode manually on the edit page and click on SAVE at either top or bottom, it sometimes doesnt get saved, even allowing for a lag of the server. If we enter the barcode on the main book list page, it does get saved. An autofilled barcode doesnt seem to get saved, either. >56 TrinityLuthAthens: Sorry to hear you're having trouble. I'm not sure what you mean by an autofilled barcode not getting saved. You mean when you select the "next available barcode" option, when editing from Your Books? If you wouldn't mind emailing me (loranne@librarything.com) with a few details, like browser and operating system combination you're using, I'll take a look and see if I can sort out what's going on. For the record, I just did a bunch of manual adding of barcodes to my own books, and didn't have any problems with them saving. Hello and thank you for the response. Yes, when we see the Next Available Barcode on the page where we are manuallly entering other info on the music title, then press SAVE, then go to the complete list of books with barcode as one of the settings, the barcode is not there, even after reloading. Our work around was to enter the barcode over the autofilled number, press save, then do it again and press save. The double saving seems to make it "stick." When you were doing manual adding, did you enter and save a title first, then add barcode, or do it all at once. I will be very glad to send you the system details that you are interested in...next time we are working in the music library, which will probably be next week. I will also ask my co-worker on this if she has any other details to send. >58 TrinityLuthAthens: Thanks for the update, Judy. I just sent you and Janet an email. In answer to your question, I was only entering barcodes, from the Your Books page. The books were already in my library. What can I tell my participants about how Librarything is secure from online disasters? In other words, what can you share with me (and I with them) about your safeguards? Searched the wiki and saw some questions about this, but couldn't follow a trail to an answer. Download a copy of your catalog with regular intervals and you should be fine. I will add that I have been a member of LT very nearly since the beginning (their 10th anniversary "observed" celebration is one day before my 10th Thingaversary; I joined when LT was just over two weeks old), and I have never suffered any data loss. The worst "disaster" was LT being unavailable for a couple days, and there hasn't been an outage that long for years. Of course, that doesn't mean it's impossible for a worse disaster to happen tomorrow; Tim could be hit by a bus, or the data center could burn to the ground. Any site is vulnerable once your "disasters" start getting disastrous enough (a large-scale EMP due to a massive solar flare could seriously inconvenience even Google). Back up your catalog regularly; if you're paranoid, save a copy at a physically distinct location. Thanks for the good advice as to procedure for backup. I download each day. Has anyone done the experiment to restore a file? Thanks for the input. I plan on downloading regularly to my PC which is Carbonite protected. Unless you plan to make significant changes to your catalog every day, that's complete overkill. I download my catalog monthly. And again, I reiterate because you were apparently unconvinced, LT has not suffered significant data loss. You're acting like the entire database gets wiped on a regular basis, which is flatly untrue. I said "regularly," not "daily." After we finish the flash day, I doubt that books will be added more than once a month. The school and church admins will be in charge of that. And certainly I am not unconvinced that there are protections against data loss, but I just don't find a statement concerning this. For me, I wouldn't care as much. But I am asking volunteers to spend their time on this and I imagine that the question might come up in our training session. >66 judyrus: In 63 you did say that you download each day. I think that's what lorax was responding to. ah yes....everyday while we are working on inputting books...to me that doesn't seem too much. After everything is finished we can go to backing up after new entries. >66 judyrus: Backing up your catalog (exporting) on a regular basis is a good idea, and I'd say the frequency of said backup should probably be determined by how much/often your catalog will see changes or new additions. I used to do mine once a month, but I'll admit to having let it lapse, partly because I'm busy, and partly because I trust LT's data recovery abilities. LT is very stable. Data security and stability are priorities for us, and we have multiple iterations of all member data backed up across a few different servers (some of which are in different locations). So, in the off chance one server on which LT relies were to experience a catastrophic event, odds are very good that all our (and your) data would remain intact. Thank you! That's the exact info that I wanted to have to give our volunteers. for the Trinity Lutheran Library. I would not want to ask them to donate their many hours of work without being able to assure them of your data security procedures. So, I'm fairly new at this barcode stuff and I have a couple questions. Do we get the label sheets and print the barcodes with our own printer with info from LT? And how do we get a barcode tab under "your books" ? Is there an on-line tutorial for this process? We are a pretty small library with currently about 6000 items, but we'd want to get at least 10,000 barcodes for our continued growth. >71 GraftonLibrary: Welcome to LibraryThing! Physical barcode labels can be purchased from LibraryThing at our store. These are barcodes we've printed for you—there's no way to print them on your own printer. Barcodes come in sequential batches of 500, and you can order multiple batches at once, and even pick the barcode number range you need (i.e. Barcodes 1-500, 501-1000, etc.). To see your barcodes in your catalog (Your Books page), you'll need to add the field to your display settings. Head over to the settings page (hint: you can also reach this from the "Settings" button at the top of the Your Books page). Drag and drop the "Barcode" field onto the Display Style of your choice. "Barcode" can be found under the "Physical" category on the right-hand side of that page. Be sure to click "Save changes" at the bottom of the page when you're done. I hope this information helps! Feel free to post again or email us (info@librarything.com) if you have any further questions. Ok, I bought the barcodes and cuecat from the LT store. When I scan a barcode in my library, it gives me .C3nZC3nZC3n2CNz2E3f1DxnY.ahb6.C3nZDxS. But when I scan it in the search function to double check that it saved properly, it converts to 00068 and my library tells me "no books found". Did I skip a step? The search function knows how to convert the encoded output of the cuecat to it's real value. What does "when I scan a barcode in my library" mean? You may need to declaw the cuecat by opening it up and snipping a wire to get it to stop encoding the output. If you need to there are directions around here somewhere. When I double-click on Barcode in my library, scan and save a barcode, I get the long code I posted in my previous message. It doesn't convert to 00068 (the number used in this particular example). But when I search my library by scanning a barcode, it does convert and then it doesn't find the book because when I saved the book data it was in the long code format. I got around it by just typing the barcode numbers as I inventory books, but I was wondering if I did something wrong. I think perhaps the function that saves a barcode should decode the cuecat output. You could try entering that as a bug in http://www.librarything.com/groups/bugcollectors and see if you could get any developers to bite. ETA: I don't own a cuecat so I'm just reporting what I've heard. Maybe you should be doing something differently but I don't know what that could be. >74 AngelaB86: Ah, yes. When we added the Barcode field to Your Books, we didn't make it so that you could scan and enter one of our printed barcodes while editing the field and using the CueCat (i.e., we didn't make it so that the CueCat code was translated for editing the Barcode field). I'm asking our developers if this is something we can/should do. If you go to your Barcode Settings page, there's a way to assign barcodes to all of your books automatically and then apply the matching printed barcode label to each book. Otherwise, you can just apply the label to your book and enter the Barcode number in the field manually (by clicking to edit it in Your Books), as you're currently doing. If you have any questions about this or need any help, please email me at kristi@librarything.com, or info@librarything.com! Thanks Kristi! I've just been adding barcode numbers manually (adding the stickers to books as I pull them out of boxes), and it's working great. if we have multiple copies of the same collection, how can we get the barcodes. Can you please recommend some scanners which are compatable with software. >80 ColumbusCatholic: Not sure of your use case here. Our barcodes in our Store are auto-incrementing in batches of 500 (1-500, 501-1,000, etc. ), and you can assign them however you need (according to their shelf order, etc). Let me know if I'm not understanding you correctly, though! >81 SpiritofIndia: I'm going to message your profile! Idk who else would be but I certainly am!